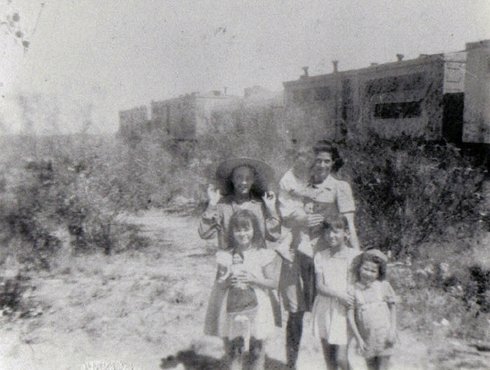 Big Bend, Painting the Desert, Life on a West Texas Paint Train in the 1940s. My father, J.C. Hall, was the paint foreman for the Santa Fe Railroad Slaton Division. Mother's name was Billie Delma Lindley Hall. Our living quarters were literally on the railroad track. Our family occupied the foreman�s car. I remember that my sister and I had bunk beds to sleep on. For the support of the working crew there was a cook�s car, a car for sleeping quarters, a coal and water car, a paint car, and a materials car. That string of six railroad cars was our home for eight years. 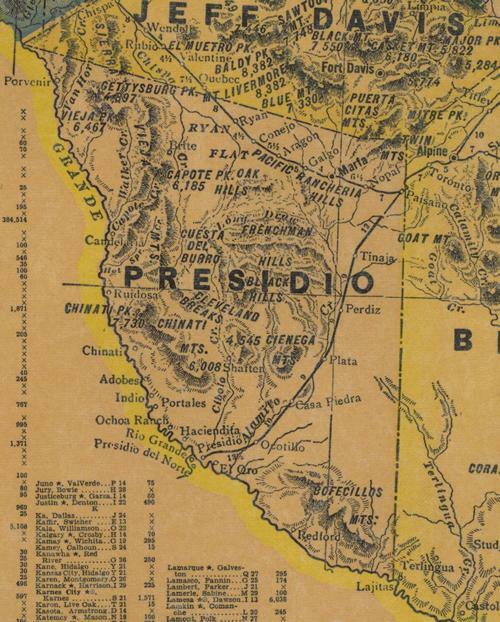 Our journey began at San Angelo, Texas and stopped at Presidio. Our crew painted depots, crossing signs, and all railroad structures, including outhouses. Daddy�s territory was 1,400 miles from Altus, Oklahoma to Presidio, Texas and all the Santa Fe lines running crossways. We moved every few weeks and saw much of the State of Texas. Of our travels, we carry the Big Bend area fondly in our hearts. 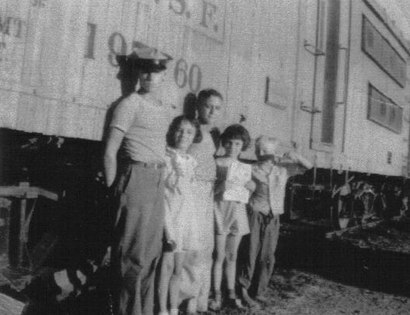 My cousin, Dorothy Hall Dodd was married to the Fort Stockton depot agent, Herring Dodd. She was recently widowed and currently resides in May, Texas. My sister Lola and I are still influenced by the remote places. She lives in Arkansas and I live out in the wilds of Arizona. We are both in our 70s now and were so afraid our Papa's love for the steam engine days would disappear. We have enjoyed some good laughter plus some sweet memories in writing this letter. Our pictures are few as this was a long time ago. A great drought was on and the longhorn cattle were dying everywhere. We crossed ranch land in an old Model A Ford�my father, John Chester Hall, my mother, Billie Della Lindley Hall, my sister, Laura Hall and myself, Lola Hall. Woman in hat is Billie Della Lindley Hall with Lola Hall Norton in front of her. To her right is Laura Jean Hall and friend. The tall woman came to take over cooking for the crew. Prior to her arrival Billie Hall cooked for the crew. 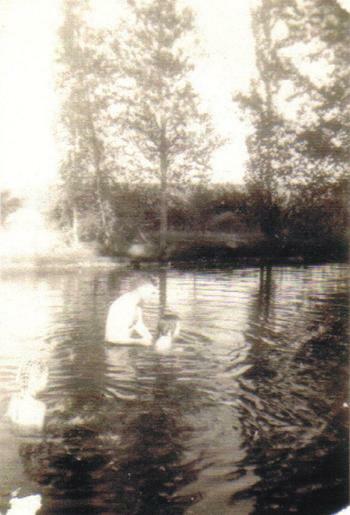 Tinaja, Texas had a railroad water tank, many shade trees and very special, natural spring-fed swimming pool. The bottom of the pool was a rock bottom. It even had a diving board. Our good Daddy had made it long ago for his daughters. It had quite a few trees in it, so our Daddy cleaned it out some and we got to enjoy it. What a wonderful treat! The Santa Fe Railroad built a water tower there for the train engine to water up to make the trip on down to Presidio. "The pool at Tinaja was fed by a natural spring." We went to school where one very sweet teacher taught all the grades. I don�t recall her name. The children were supplied cans of peanut butter to spread on tortillas they brought from home. Evaporated can milk was mixed and passed around to all, at lunchtime. My sister and I carried sack lunches and traded our sandwiches and fresh fruit for some of their peanut butter and milk. We played school yard games, �Tag� and �Red Rover Come Over� during recess. We learned some Spanish and they learned some English. They were the best mannered children and made us welcomed there. We were sad to leave. I can�t recall any buildings but the school. We rode in a pickup truck with two little girls from Plata. Their father, named Gus, was a section hand for the Santa Fe Railroad. Our father knew him and his family. 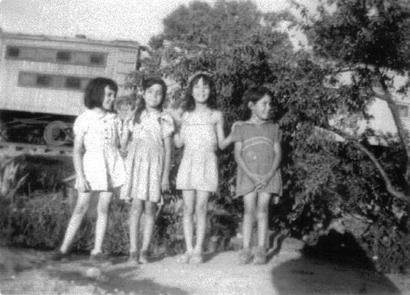 We, four girls, were the only children there and so glad to be friends. All told, Gus and his wife were the parents of nineteen children, some already grown. We spent a good Christmas there. We shared Mother baked cake to trade for squash and vegetables from Gus and his family. Daddy was a hunter and fisherman. He always shared his bounty with his neighbors. We were monetarily poor, but so rich in the things that count. Very remote�just a railroad section house. An old couple named Fannie and Mac McKinley lived there with their dog, who had his own plate set at their dining table. They were truly wonderful, warm people to know. Fannie tried to teach us girls how to play the piano. They raised turkeys, which often felled prey to coyotes, mountain lions, and bobcats. Mac McKinley was a section foreman, for the Santa Fe RR. They lived in the section house on one side of the tracks and there was a ranch house on the other side of the tracks. J.C. Hall painted the section house every other year. 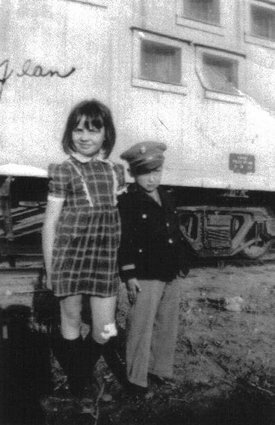 Sometimes our father would put the motor car on the tracks and send Lola and I (all by ourselves) down to visit with the McKinleys. When we got there, Mr. McKinley would take the motor car off the tracks and when we were ready to head back, he would put the motorcar back on the tracks towards our boxcars. I am sure that the Santa Fe Railroad would have had a fit if they knew that. A large school with lots of children. I was thirteen, and my sister was 11-12 years old. The town had a drugstore, with a pharmacist, a large caf� and several businesses. We took picnics to the Rio Grande River on Saturdays to swim, play and have good time. A family named Fenny raised pigs. They kept them in adobe ruins, fed and water them. For their living, the Fenny family would sell the pigs fattened up after they fattened them up. One December day, snow fell on Presidio, Texas. It was very unusual. Everyone came outside to touch it. It seemed no one owned a coat and I thought it was strange. But, when the snow melted quickly, I understood better. Who needs a coat in the �Big Bend�? Also, I remember the pharmacist who sent penicillin out to my mother for a serious burn. It was new then. He said, �I hope this medicine helps her.� It healed her and she went in person to thank him for his help. Good folks lived in the Big Bend area.